Diamond Nexus, top online retailer of affordable engagement rings, recently welcomed a new member to their marketing team. Now they’re just not sure what to call her. Meg Strobel, a spunky twenty-something from Milwaukee, joined the team months ago, but is still without a job title. Her primary responsibilities include monitoring Diamond Nexus' social media presence and creating new content for these sites. 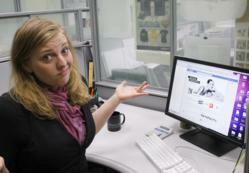 “I basically sit on Facebook all day, I don’t know… I do other stuff too,” said Strobel of her new position. Trouble arose recently, however, when Strobel attempted to order corporate business cards for herself. Without a job title, the cards remain unordered. Current candidates for her title include: Social Media Strategist, Web Communications Architect, or Facebooker Extraordinaire. “I’m kind of leaning towards Web Communications Architect, because how cool would it be to actually be an architect?” Strobel welcomes further suggestions from the general public. She can be reached via facebook.com/diamondnexus. Diamond Nexus was founded in 2004 with the purpose of bringing to the public the powerful benefits of the lab-created diamond simulant revolution. They have over 250,000 customers worldwide that have awarded them an "A+" rating with the BBB, and are the ninth largest online jewelry retailer in America according to the 2011 IR500 list. For two years in a row brides from The Knot have selected them as their Best of Jeweler. Diamond Nexus currently has two retail locations: their flagship store at Woodfield Mall in suburban Chicago, Illinois, and a second store at Mayfair Mall in Milwaukee, Wisconsin. In 2009 the company was named the official jeweler and crown maker of the Miss Universe Organization as part of NBC/Universal’s “Green is Universal” environmental initiative.